Francesca Caccini's La liberazione di Ruggiera dall'isola di Alcina is the only one of her 16 dramatic works to survive complete. Revived by Brighton Early Music Festival in 2015 (see my review), it has now been recorded by Allabastrina & La Pifarescha directed by Elena Sartori, with Elena Biscuola as Alcina, Mauro Borgioni as Ruggiero and Gabriella Martellacci as Melissa, on the Glossa label. Francesca Caccini was the daughter of Giulio Caccini the composer and musician at the court of the Medici in Florence. She received a fine musical training, and rose to become the highest paid musician at the Medici court. In 1625, at the time of the engagement of her daughter Margherita, Archduchess Maria Maddalena of Austria (regent at the time), put on a series of entertainments and for the visit of her favourite nephew, the crown prince of Poland, these included Francesca Caccini's opera. It was called a 'commedia in musica' and performed, not in a theatre but in the loggia of the Villa Poggio Imperiale. It finished with dances involving members of the court and a horse ballet! The plot is based on Ariosto's Orlando Furioso but with a few changes. So that in Francesca Caccini's opera, Ruggiero (Mauro Borgioni) has been seduced by the sorceress Alcina (Elena Biscuola) and he is held captive on her island, surrounded by Alcina's young ladies. The sorceress Melissa (Gabriella Martellacci) arrives to rescue Ruggiero which Melissa does disguised as the god Atlante (Atlas). Alcina's former lovers and their wives have been transformed into plants, and these are freed too. The whole has a prologue with Neptune dedicating the opera to the noble Prince who was the Medici's guest. There are significant differences in tone between this recording and the one I heard in Brighton. At BREMF the fact that the piece was described as a 'commedia in musica' meant that the production used wit and imagination, and the main two roles were cast with a soprano and tenor. There is something rather wryly amused about Caccini and her librettist's treatment of the subject with such things as the scenes for the singing plants. But the politics of the piece were important too, Florence was ruled by a woman regent and the story says a lot about women's exercise of power. On this disc, Elena Sartori's approach is one of high seriousness, emphasising the work's seriousness of intent and losing out on the fun. She treats it as a sober dramatic work rather than as an entertainment with a serious purpose. In her booklet article she talks about the works burnished uniformity and how Francesca Caccini favoured the mezzo-soprano and baritone registers. With Alcina sung by mezzo-soprano Elena Biscuola and Ruggiero by Mauro Borgioni, the piece does take on a darkly sober hue. Both sing the music admirably, ornamenting the divisions finely and Borgioni is able to lighten his voice, but their duet is somehow earthier and lacks the sweet-seduction of a version for soprano and tenor. As Melissa (who spends part of her time en travestie as Atlante), Gabriella Martellacci displays a fine, reverberant lower register which brings great colour to the role though there are odd moments when she and Biscuola sound a little too similar for comfort on a recording. The smaller roles are admirably taken, and the ensemble accompanies stylishly directed by Sartori from the harpsichord. Sartori is also responsible for the edition used. There are various moments of improvisation added, and the missing dances are inserted towards the end to make a satisfying dramatic whole. The disc was made in the Salone d'Onore di Casa Romei in Ferrara, but the recording has quite a resonant acoustic and I could have wanted something a little more intimate. 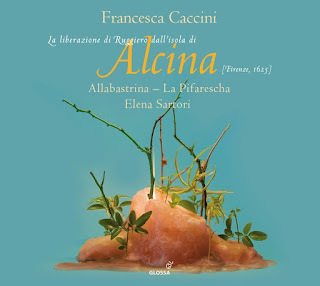 This isn't the first recording of the work; there have been at least two previously neither of which is currently available, so the release of this disc is a valuable contribution to the ongoing re-invigoration of interest in Francesca Caccini's music. Francesca Caccini remains a somewhat neglected composer, but this disc's desire to treat her with the seriousness she deserves seems to have rubbed off onto the performance. Personally I would prefer a recording which brought a little more lightness and wit to the piece.